The creators of Big Bird and the Cookie Monster do a lot more than produce the popular show Sesame Street — they are also a non-profit organization that houses research and development departments. 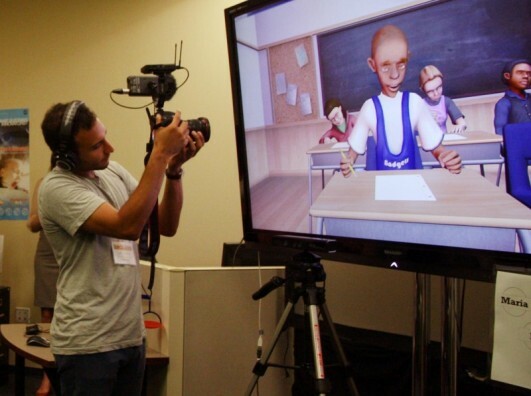 One such department has taken interest in TeachLivE, which was developed by three UCF professors to teach educators through a virtual classroom experience. On Friday morning, researchers from Sesame Workshop’s Joan Ganz Cooney Center, named after the creator of the children’s show, arrived at UCF to film TeachLivE in action for a case study. “We decided to do five video case studies on how teachers are training the next generation of teachers to use games, and part of that is about using games themselves to do some professional development,” Jessica Millstone, an education fellow at the Joan Ganz Cooney Center, said. She and other researchers had witnessed TeachLivE in action during a conference of Bill & Melinda Gates Foundation grant recipients, and what caught their attention was not only the unique technology of the virtual classroom but also the reaction of the conference attendees. Sesame Workshop chose five participants for video case studies, with TeachLivE as one of the subjects. Friday’s visit was designated as a filming of the technology in action, and the researchers sampled TeachLivE while the cameras were rolling. TeachLivE — TLE representing “teaching learning environment” — was created by Lisa Dieker and Mike Hynes of the College of Education and Human Performance, and Charles Hughes of the College of Engineering. The technology has spread to 23 other universities, with UCF leading the charge. Dieker agreed and said the case study was a great opportunity and honor for TeachLivE and UCF. Dieker said that something they especially wanted to exhibit in the video case study of TeachLivE was what she called its sandbox technology. Aleshia Hayes is a modeling and simulation Ph.D. student and the director of technology at TeachLivE, and has been studying the technology as part of her dissertation. The effectiveness of TeachLivE is being studied thoroughly as it’s a very unique and new way to teach. Millstone said the technology she saw used with TeachLivE was unlike any education teaching method out there. “It’s amazing to me, because it doesn’t seem that atypical that you would do some kind of role play, and teachers, of course, are always doing role play in their classroom … that’s a great way to get kids to feel immersed in a topic and a subject area, but I’ve never seen people do it with teachers. So, that to me is the real innovation of teachers are learners, too,” Millstone said.